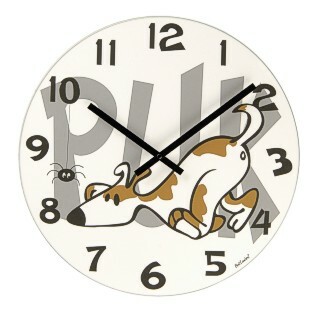 This funky clock of a stylised cartoon puppy dog on the trail of a spider would make a great gift or addition to the home. It is 43cm in diameter (17 inches approximately) and has the word Puk in big letters across the face. The polychromatic graphics are printed on a glass dial which has metal clock hands and bevel ground edges for a quality finish.